The six steps to get your face to stop hurting. More often than not, razor burn is preventable. It is the love child of haste and carelessness. And it usually happens when you don't properly prepare your skin to get scraped with a razor, or when you use an old razor, or when you neglect your post-shave recovery regimen. If you want to know how to prevent razor burn, maybe it's time to craft a thorough shaving routine, so you can leave the bathroom fresh-faced and irritation-free each and every time. 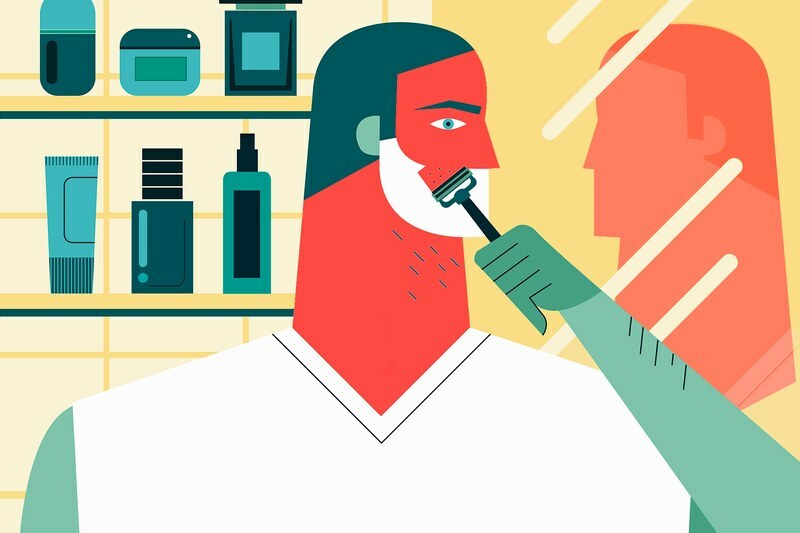 These are the six most important steps you can take to ensure a clean, pain-free shave. 1. Properly prepare the skin with hot water and pre-shave oil. Warm the area with a hot shower or towel immediately before the shave. This softens the skin and hair and opens the pores, giving you a smoother shave with less friction from your own stubble. Secondly, apply a pre-shave oil to further relax the hairs and condition the skin for the harsh dragging of the blade. Some, like Mountaineer Brand, contain tea tree oil which is a natural antiseptic and helps to prevent infections from the razor. Do both of these things and you will prevent ingrown hairs and irritation, since the hairs cut cleaner and the blade moves more smoothly atop the skin. 2. Use a clean razor with fewer blades. Modern advertising would have you believe that more blades means a better shave. Sure, it might mean you can avoid a second pass at the hairs, but if you properly prep the skin in the first place and are shaving with a fresh blade (meaning, there’s no dead skin and bacteria accumulated on it), you shouldn’t have any problems with a standard 3-blade cartridge. The reason you might want fewer blades—or to switch to a single-blade safety razor—is that you can minimize the number of blades that are combing over your sensitive skin. Sometimes too much is just too much, and that fourth or fifth blade will only irritate the skin instead of offering any real benefits. For a reliable 3-blade shave, you can’t go wrong with Gillette Mach3. If you make the switch to a double-edge, single-blade safety razor, Merkur is the name to trust. Swap a safety razor each time you shave, and never use a standard cartridge razor more than four times. 3. Consider a badger brush. If you’re shaving hairs that are more than a few days old, you might be able to lift them up away from the skin by applying your shave cream with a badger brush. You simply wet the brush in warm water, poke a hole in the center with your finger, then fill it with cream, before applying it in circular motions against the grain on your face, to build a milky lather while also pulling the hairs up and priming them for a nice, gentle mowing. I've yet to be disappointed with my badger brush from The Art of Shaving. 4. Lighten your grip. If your razor is clean and sharp, if you have properly prepared the skin with warm water and pre-shave oil, and if you’re lathered in shave cream, then all the elements are in place for a smooth, friction-free shave. Don’t add any unnecessary force, which will only irritate the skin. Instead, just lightly glide the razor against the grain of the hair, and it should cut on the first pass. 5. Lather again if necessary. If you do need another pass, don’t hack at it with the razor immediately. You’d be begging for a bloody nick. Instead, rinse the blade in warm water, reapply shave cream to the spot, and then shave the patch again in the same direction—against the grain of the hair. 6. Calm the skin with cold water and an aftershave balm. Just as you opened the pores and relaxed the hairs before your shave, you need to close everything back up and make it firm again after the fact. Just splash some cold water on the face after you shave, which will close the pores. I like to do this with a cleanser, too, to get rid of any excess skin or hair or product that might take residence inside your pores. Then, after the cold water, apply a post-shave balm, which nourishes the skin with vitamins as it rebounds from the entire procedure. Balm also protects the skin like a shield, preventing anything from clogging itself inside your pores. I love Pacific Shaving Company’s caffeinated balm, which energizes the skin while also protecting and nourishing it. By taking these steps to help your skin properly recover from the shave, you in turn prevent redness, irritation, bumps, and ingrown hairs.